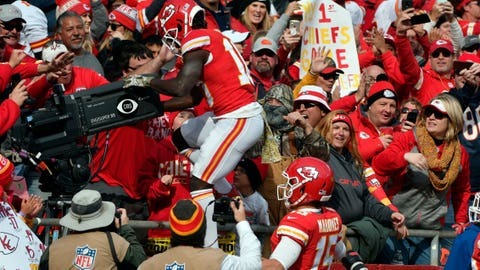 Wide receiver Tyreek Hill climbs behind a television camera following his touchdown Sunday against the Cardinals. Chiefs receiver Tyreek Hill was the latest to go old school when he commemorated his second touchdown in Week 10 by commandeering a TV camera like Cincinnati’s Chad Ochocinco once did. “The celebration just came into my head,” said Hill, whose actions netted an unsportsmanlike conduct penalty and coach Andy Reid’s ire. Hill was flagged for unsportsmanlike conduct in Kansas City for taking over the TV camera, just as Thomas was for pulling a flip phone out from under the goal post padding after his fourth-quarter score against LA. Byard met with his coach, Mike Vrabel, who had a big problem with his defensive back’s actions. Vrabel said he wants players to celebrate with each other and not stand up an opponent. Last year, Bill Belichick decided to stay in Colorado after a win at Denver to acclimate to the altitude of Mexico City’s Azteca Stadium (elevation 7,200 feet) by practicing at the Air Force Academy (6,621 feet). McVay said the trade-off is scrubbing the team’s routine, but the wildfires and mass shooting in Thousand Oaks have made training in Southern California anything but normal anyway. The Rams will train in the Rocky Mountains on Thursday through Saturday before flying to Mexico, and McVay said a second charter with family members will fly out from LA to Colorado later in the week.